A further multidimensional work by Tomasz Pauszek a.k.a. 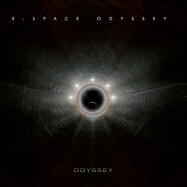 Odyssey: This album is a convincing mixture of "fine-tuned" sequential electronics, organic ambient music and dynamic electronic rock-pop based on ingenuously programmed percussive patterns. Odyssey has prepared 120 minutes of enthralling music, which is jolly hard to be classified insofar as the elements of sequential electronica, el-pop, chill-out and ambient music get melanged in one interesting whole, and what joy, there are almost no pauses between the tracks, so that there is "automatically" more atmosphere and depth, more time to contemplate. A musical journey definitely worth being taken. A further multidimensional work by Tomasz Pauszek a.k.a. Odyssey: This album is a convincing mixture of "fine-tuned" sequential electronics, organic ambient music and dynamic electronic rock-pop based on ingenuously programmed percussive patterns. Space Overture leads the Listener immediately into some other world, world filled with a cosmic scent of freshly charged batteries - while Between Worlds with its dynamic rhythm-sequences allows the Listener to balance on the edge of the well-known world and some other totally different one, paved with light-blue anti-gravitational stepping stones. One of the most fascinating pieces in the set is doubtless Silver Q, a very dynamic and still very subtle one, with "hidden" percussion pads, rather thought-of than really present. The most important factor of this composition are floating chords "smeared" in the background and some further washes and sweeps; this impression definitely has something in the mood of Klaus Schulze's murky numbness in Silent Running (Trancefer, 1981). The next track, The Deep, also consists basically in skillful conjuring-up of Schulzean moods and harmonies, this time rather in the mood of The Beat Planante (Inter*face, 1985), whereas smeared chill-out chords are not as important as the title "depth", got into with a little help from percussive marks, vocoder pads and echoing chord waves mixed together in one go. Stellar Blue is a conclusion of a bigger whole, drifting yet further in the direction of frosty abstract ambience, and still perfectly shaped and divided in clear rhythmic phrases. Bringing the Light breaks the journey into the abyss of oblivion and marks a sudden change of mood: there it comes, a shiny ostinato slightly touched by nice phasing of a Timewind, with a melancholic keyboard melody a'la JMJ's Oxygene or Les Chants Magnetiques wrought into it. Zenithal is a further break in telling cosmic stories: we are getting closer to IDM and rhythmic laptop ambience than to typical Berlin-inspired electronica. I.O. and Lunar Sky are splendid el-pop pieces in two different moods: the first one is very lively, dynamic and groovy, whilst the other one is very relaxing, soothing and almost ethereal: cloudy soundscaped passing slowly across the evening sky. And then - time for a dessert: two homages to Jean Michel Jarre. Planet B definitely has something in common with experiments presented on Printemps du Bourges, whereas Oxygeum, as its title already suggests, brings a handful of nostalgic ostinatos and melodies skillfully styled-up to resemble characteristic PPG Wave 2-sounds - well, this is how Oxygene 14 or Equinoxe 9 would have sounded like! Odyssey has prepared 120 minutes of enthralling music, which is jolly hard to be classified insofar as the elements of sequential electronica, el-pop, chill-out and ambient music get melanged in one interesting whole, and what joy, there are almost no pauses between the tracks, so that there is "automatically" more atmosphere and depth, more time to contemplate. A musical journey definitely worth being taken.